Stoke City boss Mark Hughes says he wants to make another "top-quality" signing before the start of the season. The Potters have brought in seven new players during the summer and have been widely linked with Ukraine winger Andriy Yarmolenko. 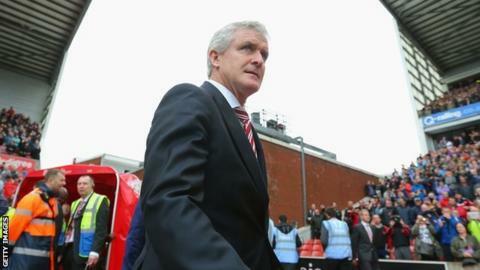 "He's the level of player that we hope to bring in if we can," Hughes told BBC Radio Stoke. "We're still hopeful we can get a player of top, top quality - if we can do that we'll probably be done." Hughes switched his sights to Dynamo Kiev forward Yarmolenko, 25, after failing to finalise a deal for Inter Milan's Switzerland international Xherdan Shaqiri, despite agreeing to pay a club-record fee. "We've missed out on a couple of players that we haven't been able to get over the line," said Hughes, who also saw potential deals for Chelsea's Victor Moses and Sporting Lisbon defender Cedric Soares fall through. Stoke have been taking part in the Asia Trophy tournament in Singapore, but Hughes is now looking forward to seeing how his new-look squad continues to bed in on home soil before the new season starts on Sunday, 9 August. "We haven't hit the highs that we will do in the season because we're still coming together as a group," the Welshman added. "I'm encouraged by the technical ability we've added - I think Joselu will add to that and I'm very pleased with the other players we've added." Stoke finished ninth last season - their best Premier League finish.